Novel Summary A Brief and Luminous summary of Toni Morrison's Novel, "Jazz"
A Brief and Luminous summary of Toni Morrison's Novel, "Jazz"
Hey are you thinking of Jazz music? If such you are about to get something more extra melody and mellow than that in Toni Morrison’s Jazz. It is experimental in that it challenges the conventions of the American canonical literary narrative. Jazz is heavily focused on the history of blacks in the United States. 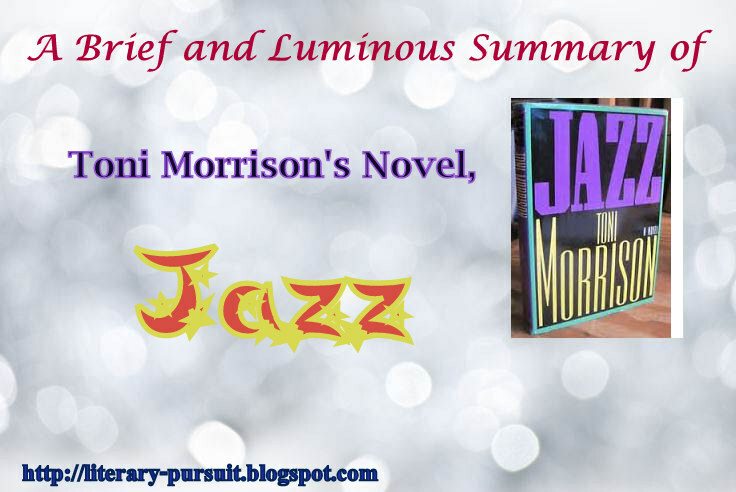 Because what Morrison does in Jazz is to give a sense of both the scandal of jazz music and its historical context. The novel was first published in 1992, a year before Toni Morrison was awarded the Nobel Prize in Literature. The novel blooms in the black Manhattan neighbourhood of Harlem, the year is 1926 and on an ice-cold winter morning, a woman named Violet Trace has thrown open her windows and emptied her birdcages of their flocks, including her favourite, lonely bird that always said "I love you." Violet is a fifty-year-old black woman, she is skinny and emotionally unstable. As the novel goes we discover the love triangle between Violet, Joe and Dorcas. Violet and Joe are unhappily married and living together in an apartment in Harlem when Joe falls in love with a seventeen-year old girl named Dorcas. Joe and Dorcas meet when Joe comes to Dorcas's aunt's house to sell ladies cosmetics. Joe talks with Malvonne, an upstairs neighbour, and discusses the use of her empty apartment so that he and Dorcas can meet there. This arrangement continues for several months and neither Violet nor Alice Manfred, Dorcas's aunt, have any knowledge of the affair. Although Joe brings Dorcas presents every time they meet, eventually Dorcas begins to get tired of the older man and starts going out with younger boys, attending parties with her best friend Felice, and making up excuses so as not to meet with Joe. When Joe finally confronts Dorcas about this, she cruelly tells him that he makes her sick and that he should not bother her any more. Dorcas prefers the attentions of a popular and good-looking young man named Acton, with whom she dances at a party on New Year's Day. Dorcas knows that Joe has not got over her and will come looking for her, so she is not surprised when he tracks her down at the party and sees her dancing with Acton. Joe, however, brings a gun and shoots Dorcas in the shoulder. Dorcas tells the people not to call an ambulance, even though she would survive if she allowed someone to help her, and she bleeds to death. Everyone knows that Joe shot Dorcas and rumor of their affair begins to spread in the community after the young girl's death. Violet appears at Dorcas' open-casket funeral and cut the Dorcas's face with a knife. Several weeks later, she begins to visit Dorcas's mourning aunt, Alice Manfred, and the two women begin to develop a friendship as a result of their shared tragedy. In the spring, Joe mourns Dorcas's death and he and Violet patch things up in their relationship. Now in this part of the novel we find about the background of Violet.. Violet grew up in a poor household in Virginia with her mother Rose Dear. Her grandmother, True Belle, came from Baltimore to live with them when Violet's father left the family. Soon afterwards Violet's mother, Rose Dear, committed suicide by throwing herself into a well. Joe also grew up in Virginia. He was orphaned at birth and raised by adoptive parents. As a young man he wondered about his birth mother's identity and tied on several occasions to find her. His mentor, a hunter named Henry LesTroy and called "Hunters Hunter," hinted to Joe that his mother was the local mystery, a crazy homeless rover named Wild. When Joe finally tracked Wild down in the woods he asked her to confirm somehow that she was indeed his mother. Wild responded with a hand gesture that Joe could not make out, leaving him to question his own identity. Joe and Violet met in a town called Palestine where they were working the fields. They got married and moved to Harlem. We are also told the story of characters such as Vera Louise Gray and her son Golden Gray. Golden Gray, the mixed race child of a white woman, Vera Louise, and a black slave, Henry LesTroy, was raised by his mother and True Belle in Baltimore. He believed all his life that he was a white adopted orphan, but when True Belle told him the truth about his father, he set out for Virginia to confront Henry LesTroy. When he arrived near Vienna, Virginia, Golden Gray spotted Wild hiding alongside the road. When she turned quickly and knocked herself unconscious, he decided to take her with him to his father's home. Wild was very pregnant and gave birth to Joe when they arrived at Henry LesTroy's house. Golden Gray never returned to Baltimore after this incident but lived with Wild in the woods, totally apart from civilization. Novel ends without any actual ending.